Fashion has been around us for centuries, however, fashion as an industry is a relatively new market. 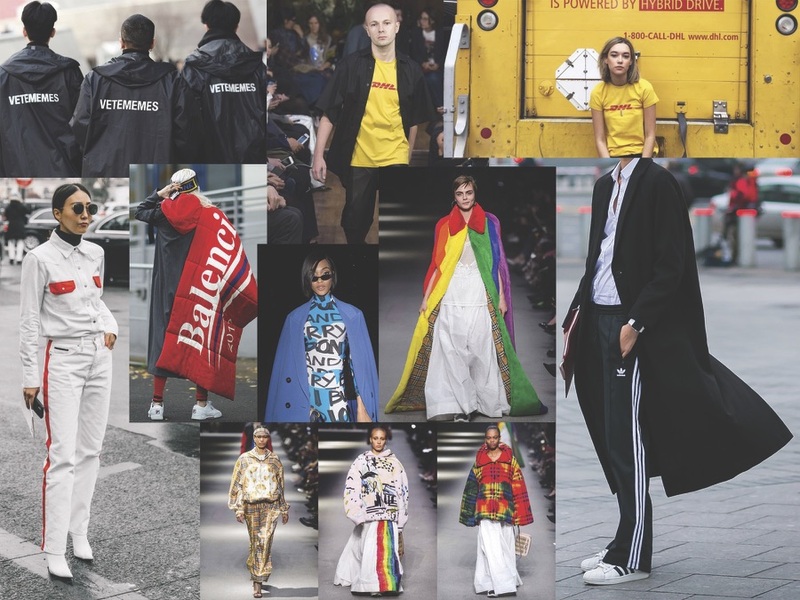 Fashion brands began developing rapidly since the 1950s, soon after the World War II, along with all the other industries which we contribute our money to everyday. More than 150 billion garments are produced every year, yet an American alone throws away about 70 lbs of clothing every year. The purpose of fast fashion is to create low-cost collections that mimic the current luxury fashion trends. Thus, it is inevitable that fast fashion embodies unsustainability, as it is impossible for the mainstream fashion market to sustainably keep up with the absurdly numerous collections the high-end brands showcase every day. 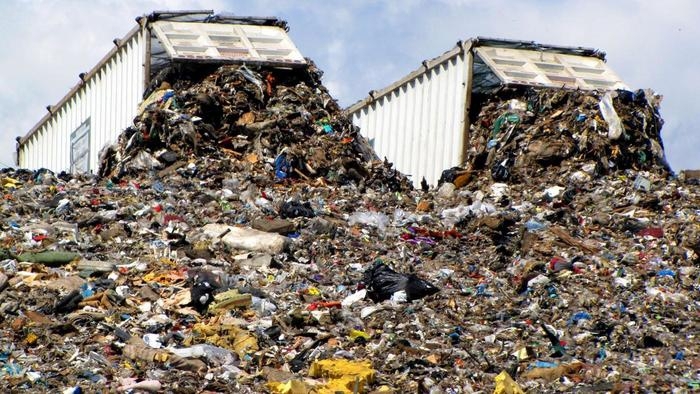 Fashion, especially fast fashion, has become such a big influencer of industrial polluter, that it accounts for over 10% of our overall carbon emission and the second largest industrial polluter after oil. The apparel industry alone uses 70million barrels of oil annually to create synthetic fiber commonly used in our clothing. This synthetic fiber takes over 200 years to decompose, yet on average, these fast fashion garments are worn less than 5 times and kept for only 35 days. Not only is the fashion industry contributing to 10% of world carbon emission, the process of creating synthetic fibers emit gasses such as N2O that are 300 times more damaging to the environment than CO2. Furthermore, the apparel industry alone, is guilty of over 70 million trees that are logged every year for fabric, and cotton alone, is censured for the world’s single largest pesticide-consuming crop that uses 24% of all insecticides and 11% of all pesticides globally. To make matters even worse, the fashion industry is also convicted of being the second largest consumer and polluter of the planet’s water resource. One quarter of the chemicals produced in the world are used in textiles, and synthetic fabric used in our garments shed plastic microfibers into our waterways. To explain things simply, plastic microfibers account for 85% of the man-made materials found along ocean shores, threatening the marine life, and ultimately, us. Now, the fashion industry has become a running treadmill that is impossible to slow down until it collapses on itself. There simply are just not enough resources available in this finite world anymore. There are not enough water ways that can be polluted, land to be destroyed, air to be polluted, and most importantly, human resources that can be exploited. 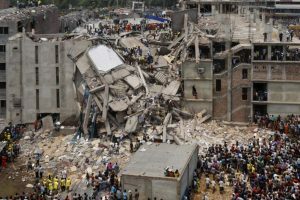 On April 24, 2013, the Rana Plaza in Bangladesh collapsed due to structural failure killing 1,134 people and injured almost 2,500 people. Rana Plaza was a sweatshop where cheap garments were made in poor working conditions to meet up with the low-budget and fast paced fashion trends in the other parts of the world, which of course, includes the United States and probably all the other countries you can think of. Consumption is occurring within the richest nations of the world, yet the consequences are targeted on people of the poorest nations. Changes have been made since the 2013 Rana Plaza disaster, however, these changes are minor, and the public, including you and I are beginning or even may have forgotten about these consequences and the warnings our planet has been showing us. We have contributed to more than enough exploitation of our precious resources, and we cannot and should not contribute further into destroying them any further. Consisting of 6 coherent bodies of work, Kenny Scharf’s identical sized acrylic paintings convey the conceptualized story of Estelle. The first painting “Me in My Car” illustrates a woman (Estelle) dressed in pink coat and hat with blue pointy sunglasses and shirt driving a red car. The woman’s emotion is hard to distinguish due to the sunglasses covering her eyes, however, her red stained lips are linear, and can be seen emotionless. The background of this setting can be seen through the glass windows of the car positioned at the back and right hand side of the painting. Within the background are palm trees; 3 on the left and 2 positioned on the right side of the painting. The sky appears blue and and clear which can also be seen via the clear reflective effect Kenny Scharf conveyed through the reflective glass which is painted between the viewer and the woman Estelle. The second painting positioned to the left of “Me in My Car” is “My New Car… What a Beaut”. The view can deduct via the title that the car appearing on this painting is identical to the car Estelle was situated in in the first painting. Unlike Me in My Car”, “My New Car… What a Beaut” depicts the outer appearance of the car. The exterior of the car is painted in light blue shade with a pointy trunk and back light, similar to the sunglasses Estelle was wearing on the first painting. The car is positioned on a gray pavement where two large orange colored flowers are positioned on each each bottom sides of the painting. “Having a TV Pizza Party”, the third piece of the series is yet another identically sized painting conveying the story of Estelle. What is interesting is that the painting is positioned right below the second painting which is a unique way of placing consecutive pieces of work together. Like the title of this piece says, the image illustrated shows Estelle holding a large pizza above her head. The pizza fills up the two half of the painting, and unlike a regular pizza, the painted pizza has three old fashioned televisions showing different space scenes which serve as toppings. Unlike the first painting where the expression of Estelle was ambiguous, Estelle is depicted with a large smile on her face. Behind her are two guys who appear to have same features except the patterns on their clothes: the one on the left with black and white check pattern and the right with black poka dot shirt. To the extreme right of the painting is a side view of a pink haired woman holding a stick decorated in pink and white. The background is once again painted in grey with leaf patterns painted throughout the empty spaces using different tones of grey. Furthermore, unlike the first painting where Estelle’s hair was completely covered by the pink hat, the third painting shows the female model’s hair as being shoulder length and dyed in bright pink. The fourth painting, positioned next to the second painting, is a vertical painting unlike the previous paintings of this series. The scene illustrated appears to be similar to the scene portrayed on the second painting, however, when closely examined, one can notice multiple differences between the first few paintings and the current, allowing the viewers to assume that the painting depicts a different day to the previous three paintings. More significant shifts include: the change in color of the car from being a lighter blue shade to a dark navy tone, changes in the design of the car, change in Estelle’s outfit from a pink coat with blue sunglasses to pink dress and red sunglasses. The color of her hair also appears yellow, which is different to the pink hair she had on the third painting. Like the second painting which portrayed the back half of Estelle’s car, the fourth painting also depicts the second half of the car on a similar position and perspective to the second. What is different however, is that whilst there were flowers positioned on the bottom corners of the second painting, the fourth painting has a white diagonal line (presumably parking line) at the lower right corner of the painting. Furthermore, there are unidentified flying objects (UFO) positioned at each upper corners of the painting. The pink one on the right is more visible and less cropped than the green one on the left. From the title of the pieces of work, we can assume that these UFOs are spaceships travelling in the distance which can be seen from the diagonal white smoke painted in direction of the movement of these spaceships. “Escaped in Time, I’m Pleased” is the fifth painting of the Estelle series. This painting shows Estelle positioned on the left half of the painting, situated on a white interior space craft. To her right are two windows which depict outer space, the solar system, and interestingly, a television which shows the coherency of this piece from the third painting. In here, Estelle’s hair is painted blue, and she appears to be wearing a pink coat with sharp collars and blue turtle neck clothe which matches to her hair color. The last painting is another vertical painting which depict outer space in black and a pair of legs wearing pink pointy heels that shoots fire (supposedly for movement). The legs are positioned from top left corner to the center where the soles of the feet are positioned. 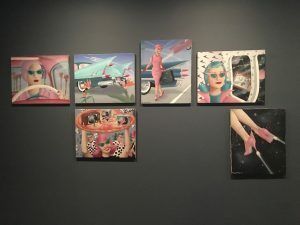 Kenny Scharf also includes white smoke which extend from the end of the heels to the bottom right corner of the painting, thus showing the movement of the female figure. Painted acrylic on canvas, the six 16 x 20 inch paintings are painted in comic style with semi-realistic color palette of pastel colors. Due to Kenney Scharf’s painting style, the series of paintings appear flat, and there is a sense of coherency within the series of work which can be reflected on the redundant elements that appear within the paintings such as the painted subjects, patterns and settings. When I first visited the Club 57 exhibition, I had no background knowledge on the artists and the works that were displayed. Because the works in this exhibition naturally was not my cup of tea, the visit left me feeling uncomfortable and questioning of such an exhibition in MoMA. The “Story of Estelle” too did not catch my eyes, as Kenny Scharf was an unknown artist to me, and there were more works that were visually provocative than Scharf’s paintings. However, upon revisiting the exhibition with a better understanding and knowledge about the artists and the types of work created during the 1970s and 80s, I was able to understand and accept the works exhibited and show appreciation towards it. The six paintings can easily be deducted as being coherent when first viewed due to multiple similarities and depictions. The story can be seen as a progression from the previous paintings, and the setting too appears to be of similar locations. Therefore, what happened before and will happen after can easily be answered via looking at the next or the previous piece of work. It is true however, that the painting evoke curiosity, as the theme of the painting is sci-fi, and open to ambiguity. 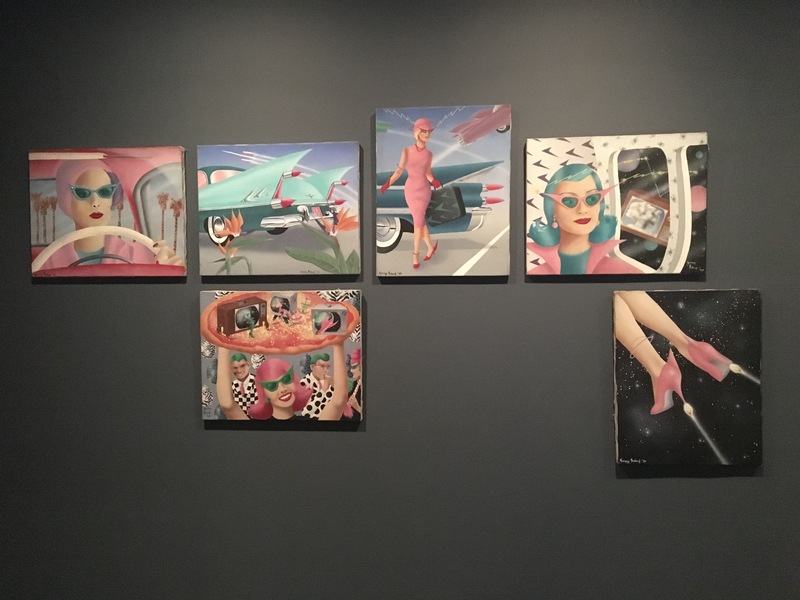 Although the story needs clarification on specific details, the overall story of these consecutive paintings can be deduced as Estelle traveling via her car to a party and then traveling once again in her car and going into space. Thus, although ambiguous in certain aspects, the painting evokes questions and answers within the works itself. The purpose of the painting, probably, is Scharf’s attempt to draw whatever he pleases to his highest potential. In Scharf’s biography, he mentions that the sole purpose of his works are to fulfill his “personal challenge […. and] to produce the best work possible (Kenny Scharf, 2018)”. The work too is an inspiration from his experiences during the 1970s and 1980s in New York, especially Club 57 and their members. 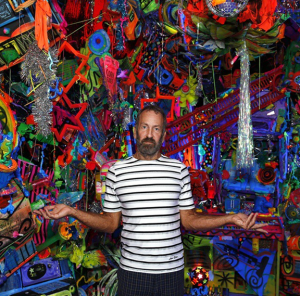 This can be deduced from the works he created during his time in Club 57 as well as his biography where he mentioned his “ambition as a professional artist is to maintain the course that [he] set 30 years ago by establishing [his] work in the fields of painting, sculpture, and performance (Kenny Scharf, 2018)”. 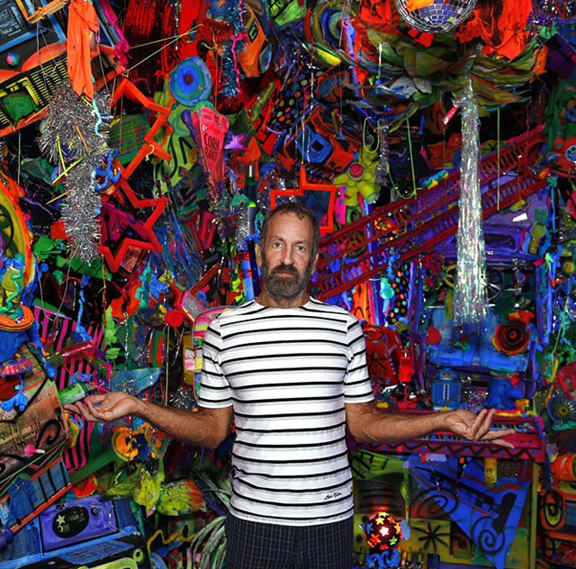 He also mentioned that every project he undertakes are “buildings on [his] pas experiences (Kenny Scharf, 2018)”. “Bio.” Kennyscharf. Accessed February 4, 2018. http://kennyscharf.com/bio/.